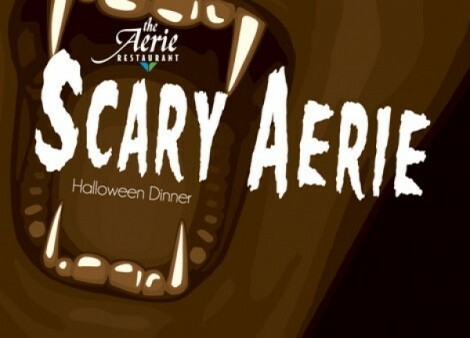 The Aerie Restaurant at Snowbird Resort will hold its annual Halloween bash—the Scary Aerie dinner—on Frightday, Spooktober 29 from 6 to 9 p.m. This is always one of my favorite ghoulish events, and the folks at the Aerie go mad with decorations and costumes, transforming the normally refined restaurant into a chamber of horrors. The cost is $39 per person for a four “curse” dinner that includes menu items such as Mad Cow Menudo, Diablo Monkfish, Devilish Wild Boar Ribs, Road Kill Ostrich Carne Asada and Mummified Shrimp Kabobs, with Black Widow Cake for dessert. There will also be a costume contest to win Snowbird lift tickets. As for me, I’ll be attending as AC/DC’s Angus Young. The Cliff Lodge at Snowbird is also offering a lodging special: $89 per person includes the Scary Aerie dinner, breakfast and a room at the Lodge. Call 801-933-2181 for reservations. Silver Fork Lodge is hosting a couple of very fairly priced dinners coming up, a beer pairing dinner on Thursday, Oct. 21 and a wine dinner on Thursday, Oct. 28. Each is a five-course dinner for $25, plus $25 for the optional pairings. The Silver Fork beer dinner will feature beers from Epic Brewing Company, and the wine dinner dishes will be paired with Australian wines and feature Chris O’Hearn from Young’s Market Trellis Wine Division to talk about each pairing. For reservations, phone 801-533-9977. At Tuscany restaurant (2832 E. 6200 South), you can now get a quickie—a quick lunch, that is. Tuscany now offers an “express lunch” guaranteed to get you in and out in an hour. “While we’re ideal for that leisurely lunch to catch up with old friends in style and comfort, we’re also well suited for business and understand that some of our guests may need a quicker pace. In fact, if you ask to be out in an hour and you’re not, I’ll buy you lunch,” said Tuscany co-owner Mark Eaton. Call 801-277-9919 for reservations.